GOLETA, CA (smt)- With all four #1s, #2s, #3s and two #4s and a #5 and #12 in the Sweet 16, the sum seed total of 49 is the lowest since seeding began. #1W-Gonzaga and #1MW-UNC have closed out games strongly while #1E-Duke needed some luck and non-whistles and #1S-Virginia trailed #16S-Gardner-Webb by 14 at one point. Beleaguered conference Pac 12 has its #12S-Oregon in the mix while the ACC (5), SEC (4), and the Big Ten (3) continue to dominate. 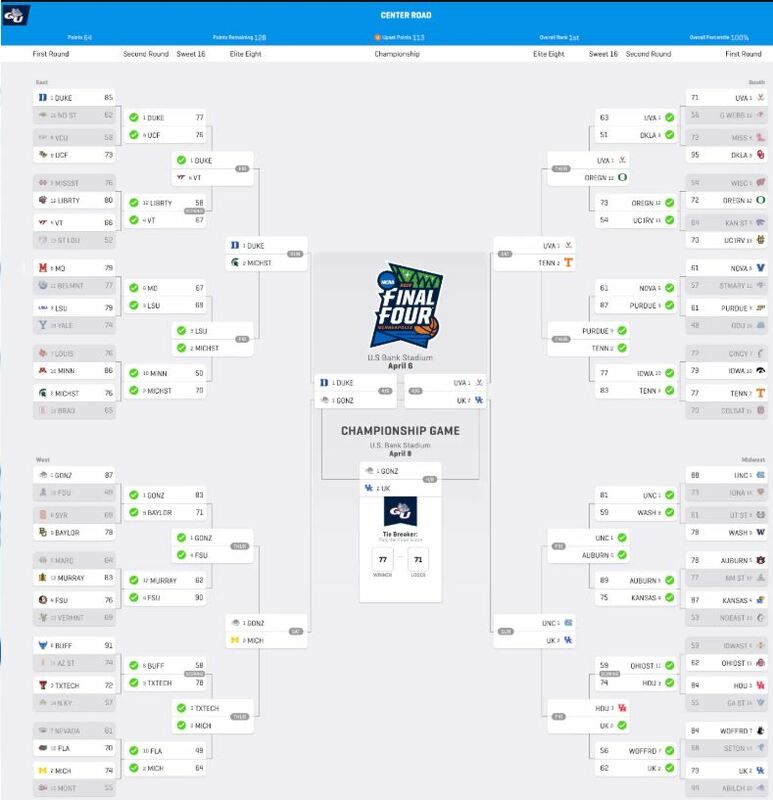 With the mostly chalk Sweet 16, one entry (Center Road) around the world actually has a perfect bracket, and he didn’t even know it! I use this sometimes in my statistics class showing the 1 in 9,223,372,036,854,780,000 odds of picking a perfect bracket or if you do some weighting of seeds, maybe get it down to 1 in 67,582,737,423. Still virtually impossible. How has our group done in 25 years? No one has gone a perfect first round with Air Fabone 23 (Scott T) going 31-1 in 2017. With Honey Badger (Scott D) going 16-0 this year, he became the first to have a perfect Round 2. What the future lie? Van&Sam (Van P) in 2007 was able to 8-0 in the Sweet 16, 4-0 in the Elite 8, and 2-0 for the Final Four. But she missed the champion (Florida beat Ohio St)! Unfortunately, Center Road was not eligible for Warren Buffet’s million dollar for life Sweet 16 challenge! If no one wins the Bonus1, then a second Bonus opportunity takes effect. The entry closest to the “Total points in final” tiebreaker wins the $40. In order to reward better play, the tiebreaker is the higher placement in the final pool standings. What this means is that of the 23 entries that were eliminated from the top 6 prizes, 20 of those entries are back into play! Overall, 155 of 162 entries still have a chance for Bonus1 thanks to the strong showing of the ACC thus far. And 159 of 162 (98.1%) have a chance of either the top 6 or bonus. The ACC is guaranteed to get a 11th win (Virginia Tech-Duke). The ACC, with 3 #1 seeds, led with 145 of 162 entries thinking they would be the winningest conference followed by the the Big 10 with 13, and the SEC with 9. Unsurprisingly, no one had the Pac 12. 33 entries each picked the ACC with 18 wins. Below are the teams in the conferences that matter for the Bonus1. It’s much too much to go through all the possibilities with four rounds remaining. But, if you do have a chance, this will guide you to which team to root for based on the conference the team is in. Here is the link to what everyone picked. If your nickname is in red, that means you’re eliminated from the top 6 prizes; if your conference is in red, you’re eliminated from the Bonus1. The eligibility for the Bonus2 won’t be discussed unless needed.